Allahabad High Court District Judge(UPHJS) Pre Exam Marks Check Here. Allahabad High Court District Judge(UPHJS) Result/Cutoff Check Here. Allahabad High Court District Judge(UPHJS) Pre Answer Key Check Here. Allahabad High Court District Judge (UPHJS) Mains Admit Card (Link Will be Activate on 20/04/2019). Allahabad High Court District Judge(UPHJS) Interview Letter Check Here. Allahabad High Court District Judge(UPHJS) Pre Admit Card Check Here. Allahabad High Court Notification is out. Allahabad High Court is recruiting for 59 District Judge(UPHJS) Govt Job Posts. You can check Allahabad High Court - Allahabad High Court last date, download Allahabad High Court notification, visit Allahabad High Court official website and check other Allahabad High Court Vacancy details.Complete Vacancy and recruitment Details about 59 District Judge(UPHJS) Govt Job vacancies in Allahabad High Court are provided below by JobSarkari.Com only for you. Last Date for Apply Online 14/12/2018. Last Date for Payment of Exam Fee 14/12/2018. Date of Pre - Examination 03/02/2019. District Judge 34 16 08 01 59. Candidate Must Have Passed Bachelor Degree in Law and Practicing Within the State of U.P. / Or Any Other State From Last 07 Years. Age Relaxation Upper Age Limit is Relaxable by 03 Years for SC / ST / OBC Category. 6.Online Application Can be Submitted on or Before 14th December 2018. Q. 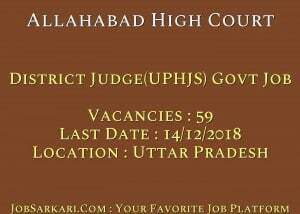 What is the Last Date For Allahabad High Court District Judge(UPHJS) Govt Job Vacancy ? A. Last Date for Allahabad High Court District Judge(UPHJS) Govt Job Posts is 14/12/2018. Q. 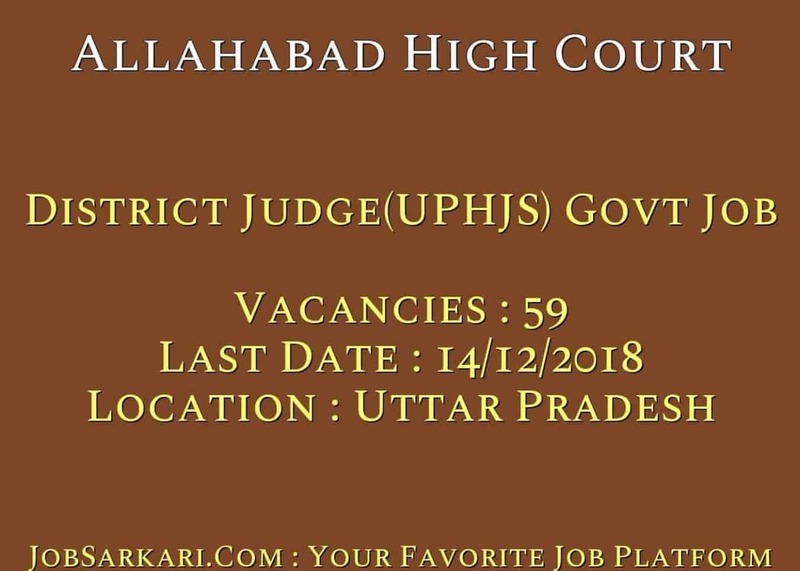 What is the Form Type of Allahabad High Court District Judge(UPHJS) Govt Job Recruitment ? A. The Form Type for Allahabad High Court District Judge(UPHJS) Govt Job Posts is Online. Q. How many vacancies are available in Allahabad High Court District Judge(UPHJS) Govt Job Posts ? A. There are about 60 Vacancies in Allahabad High Court District Judge(UPHJS) Govt Job Posts. Q. What is the Full Form of Allahabad High Court ? A. Full Form of Allahabad High Court is Allahabad High Court .